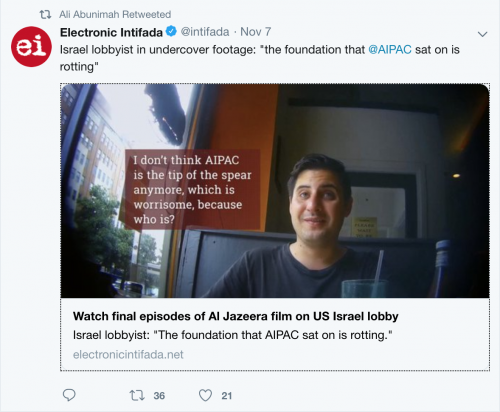 So as I predicted a number of months ago, Al Jazeera’s censored documentary on the corrupting influence of Israeli lobbying groups in the US has been leaked in full online. You can watch all four parts here and here. Despite Al Jazeera’s attempts to deflect, the network had no intention of airing it on their network and this leak was the only way that it would come to light. Normally, I would just put this in the prediction fulfilled page and call it a day, but there’s more to this than meets the eye. Criminal charges will be pressed against the leakers, but all that this will do is bring more attention to the documentary and bring a widespread effort to discuss the film’s contents on the national stage. As I predicted the leak, I am also predicting that this film will change many people’s opinions on the Israeli government and see what is now a bi-partisan support in Washington turn into bi-partisan opposition. This will be the Streisand effect in action and it is long overdue. Does the lop g space station get built, if so will it,s main use be changed to refueling rockets, will Israel be a user. I’m not that familiar with this, but my instinct is it will be built, but I doubt the Israelis will have anything to do with this. Hope this answered your question. Off topic but it is brexit again. May has agreed to a horrific deal for the UK, it must be bad as it has just took EU states only 40mins to agree to the draft. May is about to sell out the UK, this has me really worried. A lot of remainers are even saying this deal is really bad, the vote goes to parliament in the next couple of weeks. Do you have any long term visions for the UK now? May looks like she will not resign. Sorry I haven’t replied to this, but I’ve been busy and haven’t been posting as much. I’ll have answer for this in my 2019 predictions post. Look out for it on January 1st (but maybe earlier).